What do the world's first Ferris wheel, a quarter that costs 50 cents and Chicago's Museum of Science and Industry have in common? Answer: The 1893 World Columbian Exposition, also known as Chicago's World Fair. It was the site of the world's first Ferris wheel. Originally known as the "Chicago Wheel," the Ferris wheel was invented for Chicago's 1893 World Fair. A structural engineer from Pittsburgh named George Washington Gale Ferris Jr. pitched the idea of a giant metal wheel to Daniel Burnham, the lead architect of the 1893 World Fair. Burnham and others had incredible doubts that such a structure could work or be safe. After numerous safety studies, they agreed to build it. The world's first Ferris wheel was enormous. It featured 36 gondolas capable of holding up to 60 people each—for a total capacity of 2,160 people. Officially known as the 1893 World Columbian Exposition was a major event in the history of Chicago and not only because of the Ferris wheel. Today, collectors actively seek out the 1893 Isabella Quarter struck for this event - a beautiful and rare gem of a coin. In addition to its rarity and beauty, the story behind it and the era it represented adds an aura of intrigue and excitement to this silver coin with a tiny surviving mintage at 24,191. The original mintage was 40,000, but 15,809 were ultimately melted. The Isabella Quarter is also a poignant reminder of an era in which American woman were undergoing dramatic change in the movement toward the right to vote. The U.S. Congress authorized the formation of a Board of Lady Managers to help plan the event. Bertha Palmer, a Chicago socialite and wife of prominent local businessman Potter Palmer, owner of the legendary Palmer House hotel worked tirelessly to help the Chicago Fair become an incredible success. It was her leadership and suggestion that the U.S. Mint a commemorative coin with a woman on it, specifically Queen Isabella. The 1893 World Columbian exposition Isabella Quarter was the first U.S. coin feature a real woman, as opposed to the mythical Lady Liberty. It was also the first U.S. coin to feature a foreign monarch. Why Queen Isabella of Spain? The 1893 World Columbian exposition was created to celebrate the 400th anniversary of Christopher Columbus' landing in America. Potter thought it fitting to feature Isabella since she was Christopher Columbus’ benefactor and it was her directive and support that led to the discovery of America. Sales of the Isabella Quarter weren't so hot at the Chicago Fair. The main reason was that thrifty fair goers saw better value in the Columbian half dollar. Both the half dollar and quarter were sold for $1. Buyers preferred to go home with a 50 cent coin for their dollar instead of quarter worth 25 cents back then. 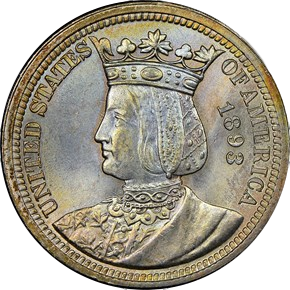 These days, the Isabella quarter sells for much more than 50 cents, with an MS69 valued at $68,500. The Chicago World’s Fair built great notoriety for the city as a powerhouse around the globe. It showed off the immense progress and growth that occurred in the two decades after the Great Chicago Fire of 1871, which burnt down nearly the entire city. Taking over roughly 600 acres of Chicago's Jackson Park, it drew an estimated 27.3 million people to the city over its six-month run. Not much of the 1893 World’s Fair remains in Chicago today. A notable exception is Chicago's Museum of Science and Industry, which was constructed as the Palace of Fine Arts for the fair. Highly desired as a part of the commemorative series and often sought after as a “type” quarter, Isabella remains a numismatic favorite and continues to see strong collector demand.